In the FAQ below, the left-hand column answers general Internet Marketing questions and the right-hand column answers specific questions about the French SEO Team. What is Search Engine Optimization / Internet Marketing? SEO stands for Search Engine Optimization and is also called Internet Marketing or Website Promotion. The focus of any SEO campaign is to appear high with Search Engines. Most English and French SEO campaigns focus on Google, as they're the search engine of choice for over 80% of people in France and the UK and over 65% in the USA. Keyword Research - Finding out what people actually search for in the search results and how competitive these keywords are (for example 5 times as many people search for 'France holiday' as would search for 'France vacation', so if you're promoting a holiday website and the competition was similar, you'd be smart to focus on 'holiday' as a keyword, rather than 'vacation'. On-page SEO - Looking at the website you want to promote and ensuring that its structure and content send a clear message to search engines as to what the site is about. This can include writing new content to target specific keywords, structuring the website to code titles correctly and have good internal links between pages, writing good metatags and ensuring that there are no barriers to a sale (such as a poor design or a complex ordering process). This is also called 'On-site Search Engine Optimization" or "Content Optimization'. Link Building - In theory every webmaster could optimize the content of their website fully, so Google and every other popular Search Engine distinguish between websites by analysing the links going TO their website, also called 'backlinks'. The more quality backlinks a website has, the higher it will appear in the search results. Metatags are embeded in the code of a web page and search engines normally show the Title and Description metatags in the search results. Using keywords in the metatags also helps a web page appear higher in the search results. How does French SEO compare to English SEO? In the USA, UK and the rest of the English speaking world, most of the top results for any search on Google will lead to a well optimized website. Webmasters with their email addresses visible on the internet will also be used to receiving link exchange requests "I've visited your very interesting website and would like to exchange links with you..."
In France, the SEO of websites is generally poorer and the owners of websites in France are less likely to send out link exchange requests. This means that an internet marketing campaign in France can be very effective in putting your website ahead of the competition. Domain Authority is "Moz's calculated metric for how well a given domain is likely to rank in Google's search results. It is based off data from the Mozscape web index and includes link counts, MozRank and MozTrust scores, and dozens of other factors". One of the major factors is how many high quality links a website has going to it. It has become a standard measure of a website's quality and has replaced PageRank, which in March 2016 Google officially declared they were deleting. SEO normally refers to 'Natural' or 'Organic' Search Engine Optimization, which is about optimizing content and building links to a website in a natural fashion. SEM stands for 'Search Engine Marketing', which can include SEO, but focuses more on internet marketing using paid adverts linking to your website and on PPC or AdWords campaigns. PPC stands for Pay Per Click and refers to Google AdWords or other advertising campaigns where the webmaster pays everytime someone clicks a link going to their website (In France, Google.fr is the most popular choice for a PPC campaign). These adverts appear at the top of the results and on the right-hand side, the organic SEO results appear on the left-hand side, as shown in the image below. 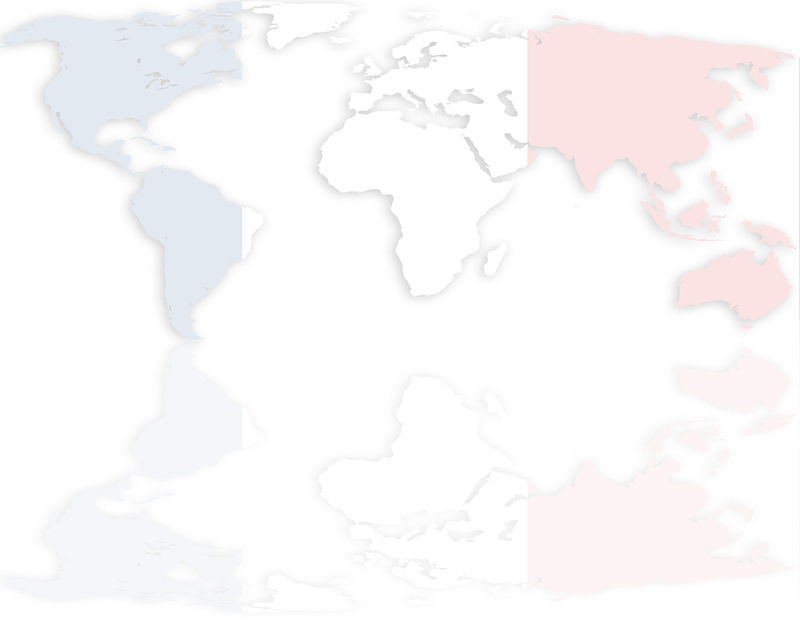 Who are the French SEO Team? We are the French Internet Marketing arm of Indigoextra Ltd, a UK registered Internet Marketing and Web Development company. 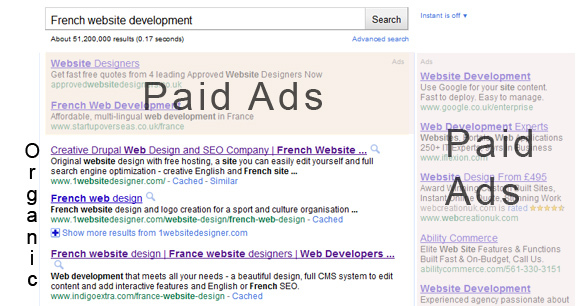 Our company includes over 20 web developers and French and English Internet Marketing experts. What French Marketing Services do you offer? Can you tell me more about link building? Do you offer other types of links or marketing services? Yes, we submit each website we optimize to 40 French and international search engines for free and also offer web promotion via social media sites such as Facebook and Twitter. We place articles on related high authority websites. We also offer Internet Marketing in English. We have completed SEO campaigns for clients that now appear on the 1st page with Google.fr for all the following keywords. Please contact us for a proposal which will include specific websites that we have achieved 1st page positions for. A significant portion of our work is on a white label basis for other companies, therefore we cannot always provide the address of the website that our SEO project is for. Internet Marketing is a race, with everyone trying to compete to be first. Guaranteeing results is therefore a little like guaranteeing that a certain runner will win a race. The answer to this is therefore normally 'no', we let our previous results speak for themselves, however if you are targeting a phrase that isn't very competitive (i.e. there are fewer serious runners in the 'race'), then we will consider offering a guaranteed result, whereby you pay 50% in advance and only pay the remaining 50% when we have achieved certain positions for certain keywords. Please contact us for more information on this. Can you offer me some cheap SEO? There are no cheap and effective solutions to internet marketing. Google is getting more and more sophisticated and can easily distinguish between spam links, which won't offer any benefit to your website and high quality links. How do you ensure 'quality links'? All content used in articles, directory details, links, etc. are 100% original and written by fluent native French speakers. We monitor the Domain Authority of links, directories and article sites to ensure that the links are being placed on high quality, popular websites. No links will go on spam sites, sites with adult content, a gambling theme or have the nofollow tag applied to them. We provide detailed reports of submissions and link placements.